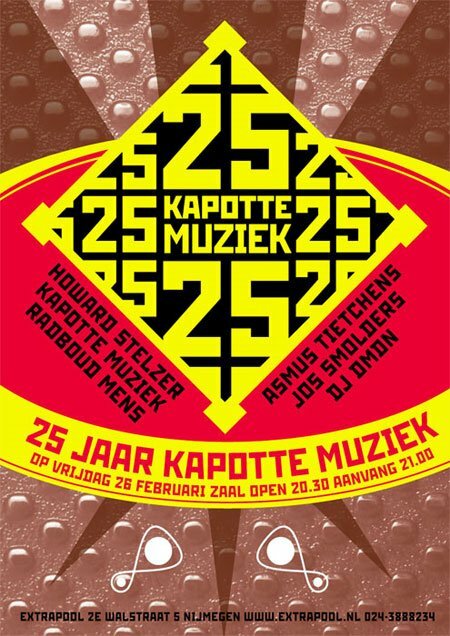 25 years Kapotte Muziek in Extrapool next Friday | Esc.rec. On October 1st 1984 the very first piece of music by Kapotte Muziek appeared on a compilation cassette. And now, 25 years later, Kapotte Muziek still exists, with a sheer endless list of releases on cassette, vinyl, CD and MP3. Untill 1993 Kapotte Muziek was mainly Frans de Waard, but after that it evolved in more of a live thing with Peter Duimelinks and Roel Meelkop. Since 2003 the Kapotte Muziek name is used by this trio only. Kapotte Muziek played everywhere in Europe, Russia, two long tours in the USA and one in Japan, playing as both Kapotte Muziek and as Goem, their techno music alter ego. They were remixed by Troum, Asmus Tietchens, Peter Rehberg, Illusion Of Safety and many others. A 25 years of existence well worth celebrating! And now we can, because Extrapool is hosting an event next Friday to do just that. Featuring an impressive line-up (with a lot of artists who released some of their music through esc.rec. ): Howard Stelzer (USA), Radboud Mens (NL), Asmus Tietchens (D), Jos Smolders (NL), Kapotte Muziek (NL) and DJ DMDN (NL). Also check this blog for plenty of history lessons and free downloads.